Wow! My passion for watches is back and it’s stronger than ever. As a matter of fact I’m sitting here today with a new piece on my wrist that has been on my WTB-list since forever. Two days ago I acquired the legendary Omega Ploprof 600. I had to give up two watches I really liked for the trade to happen (because I couldn’t come up with the cash) but what the hell. This is a true icon and looking at it just gives me a happy sensation inside that only a few special watches have the ability to call forth. It was actually quite a while ago since I bought such an expensive watch like the Ploprof. I’m currently so bored with Rolex's and other luxury brands, that have appealed to me in the past, and I have pretty much gone back to my roots which means playing around with <$500 is what I do. That is also what I like to do the most. This Omega though set me off track a little but I don’t think it’s going to affect my orientation in general. Seiko is still the brand I enjoy the most that I always will go back to when feeling lost or uninspired. Somehow that brand keeps finding new ways to reawaken my interest. #317 - My latest addition. 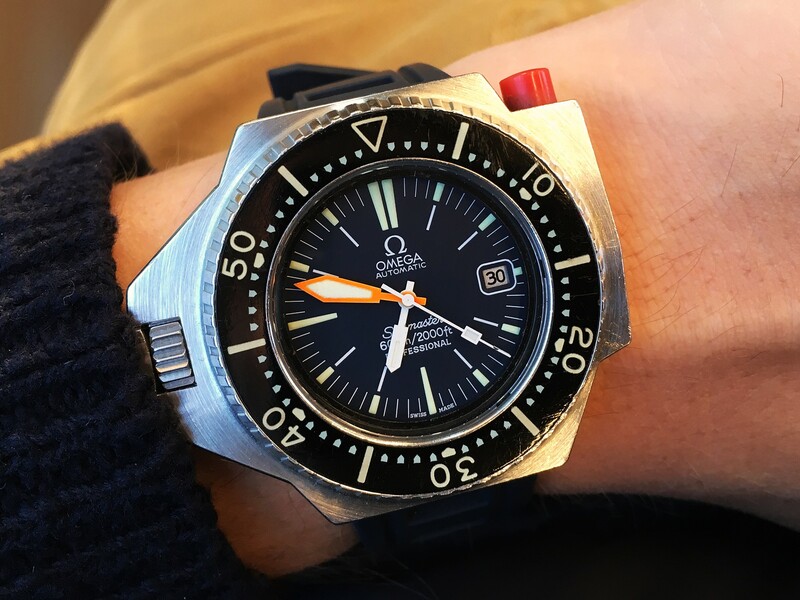 The Omega Ploprof 600, ref. 166.077. An unexpected brand that has boosted my passion a lot lately have been Doxa. I really thought I was done with them but then suddenly I got a huge Doxa revival and picked up two pieces that I’ve wanted to try out for a long time. My sight is currently set on their new re-issue of the SUB 300T that will be released later this year. It sure does look promising! I’ve even start to glance at their vintage watches a little but I’m not really there yet. The Ploprof though could very well be the vintage watch that pushes me over the edge into the world of mold and rust. So what about the last fifty watches? What have we seen? It’s been dive watches for the most part of course but also plenty of chronographs. The Tutima really was a heck of a timepiece and the two Tudor’s were also really great. We’ve also seen a couple of dress watches like the JLC Reverso, Sjöö Sandström Royal Steel, Longines Heritage Conquest, Hamilton Thin-O-Matic and Tissot Visodate. Looking at the list of watches to come there’s hardly any dress watches so it seems like my priorities were set straight. Apart from that I don’t think that there’s been that many Seiko’s and that the mix in general has been quite diversified. 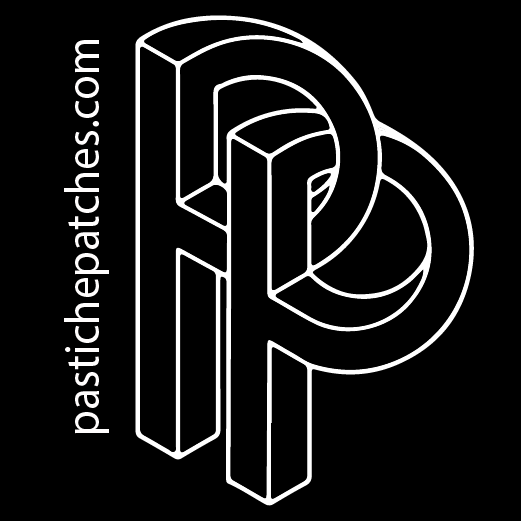 Most of the watches have given me something worth writing about but every now and then a watch pops up that didn’t leave any impression whatsoever which makes it almost impossible to squeeze out any interesting words about it. So far 238 watches (150 different models) have been presented to you. I estimate to have reached a minimum of at least 350 watches by the time I reach present day. Something is added to my WTB-list every week and at the moment I have no plans to stop adding new interesting objects to that list. When I recently gave you the story about all my Seiko 7548’s I also couldn’t help expressing my feelings about how good all the things from the early 80’s were. But as a matter of fact the second half of that century only got better. I know, it’s insane! Because during the late 80’s was when my favorite G.I.JOE characters were introduced, the NES was released in Sweden and Guns n’ Roses recorded Appetite for Destruction. Those are just a few important details that are responsible for shaping me into the person that I am today. But during this era something else highly important was created, something I didn't get to discover until thirty years later, and that was Seiko's becoming legend; the 7C43 Professional Diver, which basically was a 7548 but with an upgraded movement and with a 200m depth rating thanks to the new solution of the screw down crystal. The 7C43 is therefore even a little more heavy duty than its predecessor. What makes the 7C43 extra special is its unique black and white hand-set which is a rather small change but it gives the whole watch a new appearance. The toolness-factor of this watch is going through the roof and if I’m not mistaken I actually think that the case of the 7C43 might be a little beefier compared to the 7548 which only adds more points to the already high tool feeling. The first time I saw the 7C43 was probably sometime around 2010/2011 when I was browsing through Molle’s old homepage about his mind blowing Seiko collection. That’s when I found this amazing 7C43-700A (the pepsi version) on a jubilee bracelet. It just looked so damn good. I knew right there and then that this was a watch that was something I just had to have one day. But it wasn’t until February 2014 when I finally got my first 7C43. Unfortunately it wasn’t the pepsi version but I had to start somewhere. It was purchased together with my second 7548 (#212) from a well-known seller in the US and I was lucky to get a good deal when I bought both of them. I knew nothing about the 7C43’s and this particular reference turned out to be manufactured in Korea and the dial print had a more burgundy red color compared to the Japanese version which has a more orange tone. To my big disappointment I never took any pictures of the case back so I’m not sure about the exact reference but from what I have read it probably just was a regular 7C43-7000 but made in Korea. Anyhow, it felt really cool to finally own one of these legendary often talked about watches. But from what people told me I realized the Korean version wasn't very sought after and that the Japanese version was the one that was rarer of the two so I ended up selling mine trying to find one made in Japan instead. I’ve later heard the opposite but I’m not sure which statement is true. #213 - My first 7C43 that was made in Korea in July 1988. My second one was the 7C43-700B and was bought about a year later in February 2015. Can’t seem to remember where I got from though. It was made in Japan and had the cleaner looking “Professional only” dial with less text. I mostly wore it on a 22mm Isofrane rubber. What I really can’t figure out though is its reference number. From what I have learned the 700B-version are supposed to have the rare white dial but apparently that can’t be correct unless I had a modified version with service dial. #244 - A mysterious ref. 7C43-700B. Worn on an original Isofrane rubber. Waiting for the subway train to arrive. The third one was in good shape but it had an aftermarket bezel insert. Got it in October 2015 from a seller in Hong Kong. The dial was pretty nice but some of the print was beginning to fade. One day I noticed some fog on the inside of the crystal but Magnus helped me out replacing all the old gaskets making it waterproof again. #265 - A Japanese made 7C43-7000 from November 1987. 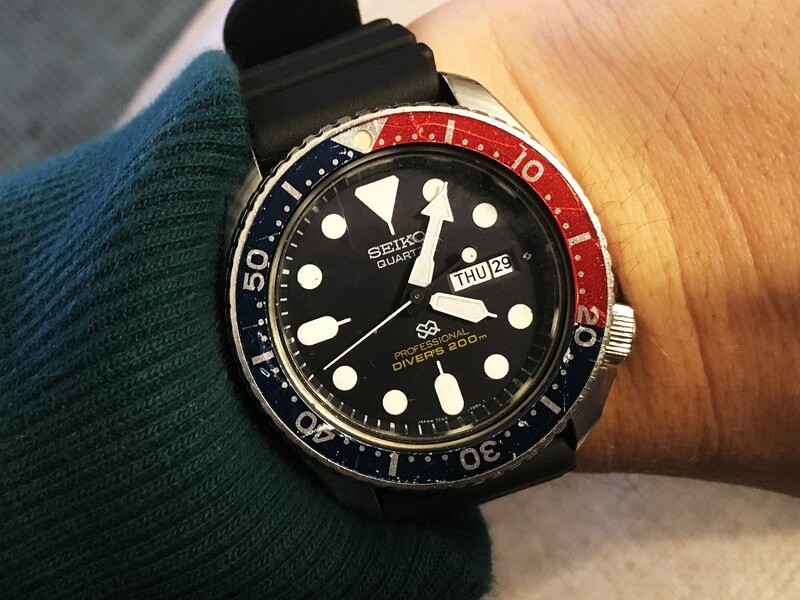 On the jubilee from a SKX diver. Perfect fit! At Magnus's for a gasket service. The fourth one was probably the nicest one of all the ones I’ve had. It was all original and the bezel insert had a beautiful even patina. The print on the dial was great and the luminous indexes and hands were all white and flawless. Not a single mark! The only thing that didn’t make it 100% perfect was a small dent on the side of the case but apart from that it was stunning. This really was one of those watches I never should have sold. God I want this baby back! #269 - The fourth one and my favorite. A 7C43-7000 manufactured in February 1988. The dent on the side of the case between 9 and 10. In June 2016 I came across my fifth one. This was the 7C43-7010. Up until then I hadn’t cared very much for the “Professional only” dial but I’ve actually ended up liking this dial version just as much. Just like the fourth one it also happened to be in a great condition. This one eventually ended up in my watch buddy Stefan’s fantastic Seiko collection. #301 - My only 7C43-7010. Together with my lovely wave patterned fleece jacket from Patagonia. Great Seiko vibe going on! The last one I had, number six, was purchased on eBay. I’d missed out on so many 7C43’s up for auction that I had completely given up hope ever finding one on eBay without being ripped off. But then suddenly, a Monday morning in June 2016 on my way to work, it was there; a 7C43-700A to a reasonable price with the buy-it-now option. It even had the make-an-offer option! I began to read the description “all original, recently serviced…” and the list went on. Everything was just perfect! Was this too good to be true? OK, it was really quite worn but that just looked cool, and the rubber it came on wasn’t original but what the hell. I was going to put it on a Bonetto 284 rubber anyway. I was hesitating. Why? All I had to do was to click it home! Finally I decided to make an offer. Said and done. I put the phone in my pocket and tried to think of something else. Impossible! What the hell was I doing? Was I going to miss out again because I was too cheap to pay the buy-it-now price and let someone else steal it right in front of my nose? Hell no! I yanked my phone out of my pocket and tapped the buy-it-now button. Relief washed over me in an awesome wave. The pepsi version of the 7C43 was mine at last. #302 - The long sought after 7C43-700A. The 7C43-700A turned out to be not as cool as I had hoped for. My expectations had been built up over so many years that it just couldn’t live up to them. But finding it and getting it home was important to me. That was satisfaction enough. To sum it all up; the Seiko 7C43’s are just awesome. Plain, simple and heavy duty. You can still get them to a reasonable price which makes them fun to keep searching for. UPDATE - October 6th 2016. Gah! I came across this perfect 7C43-7010 from April 1991 and I just couldn't say no. I wasn't searching, I swear, it pretty much fell into my hands so what could I do? The only defect was its bezel that didn't click so I had to purchase a set of spare click balls and a spring. Ended up trading it for a Seiko SBDJ013. #318 - My seventh - a 7C43-7010. Outside Mall of Scandinavia after a long day of shopping. UPDATE - January 12th 2017. Stumbled upon another 7C43-700A in the beginning of this year. This time located in Romania. Lots of patina but still looked very nice. Impossible to resist. Wore it a few days before flipping it away. Everything was good about it except for the crown which was pretty hard to turn. Probably something with the gasket. It ended up crossing the border and ended up in a Norwegian collection. #338 - My eight 7C43 and the second 700A. From July 1987. Have I had enough yet? Nope, don't think so! UPDATE - October 12th 2017. This might be my longest blog post and I can't really see an end coming to it. I guess I will just keep updating it as long as new 7C43's keep coming in. The two I'm adding this time were two stellar specimens that stayed with me for a longer period of time than any other 7C43 have done in the past. First I managed to get a hold of another Korean version which I had serviced with new gaskets and battery. It was in a fantastic condition and was worn on an all brushed jubilee. Then a third Pepsi version came into my hands and I set it up with an all brushed jubilee as well. Its dial had an almost purple tone which looked amazing in the sun. I switched back and forth between those two watches a lot during the winter and spring of 2017. It took a while to sell them because this time I decided I wasn't going to part with them unless I got paid what I felt they were actually worth. #346 - My ninth 7C43 and finally another beautiful Korean. Photographed down at the docks next to the Stockholm City Hall i mid March 2017. #355 - My tenth 7C43 and third of the Pepsi version 7C43-700A. That dial color was beautiful but don't forget about that bezel insert. I mean WOW! Sometimes I just got to throw in a dresswatch just to mix it up a little. Toolwatches in all honors but there are certain occasions when a toolwatch just doesn’t do it. Oh, did that come as a shocker to you? No but it’s actually true. I was very positively surprised by the Visodate. It looked great. Perhaps a little too big for my taste with its 40mm to function as a proper dresswatch but I guess it's all about getting used to the size. As a daily wearer to the office it was great. The price was also another great thing. Anyone could afford it without having to eat noodles for the rest of the month. And judging from the quality of the movement (standard ETA 2836-2) this piece could last you a lifetime if just serviced properly. The first one I had was the steel version with white dial which I got in early January 2014. Super easy to match with whatever shirts and jackets I put on. The second one, which I got in early April 2014, was the gold-plated version with black dial and that one was a little more complicated to match. Being gold it stood out in a different way compared to the steel version. Between the two of them I preferred the steel version with its cleaner look. #211 - The Tissot Visodate, ref. T019.430.16.031.01. #222 - The gold-plated version, ref. T019.430.36.051.01. When one of my best friends, Daniel, turned thirty my friends and I all chipped in and gave him a Visodate. He wasn’t really a watch guy but he became unexpectedly fond of it and has been wearing it every day for the last two and a half years. Everybody needs a nice watch and if they don’t agree with you just find a suitable opportunity when you can force it upon them (birthdays are perfect) and they will eventually realize they'd been wrong. It works every time! This was another post that could have been divided into two separate but I chose to bundle them together instead. Sometimes it feels right and sometimes it doesn't.